Pet Health Care aims to bring pet products and services to the South African pet loving market. 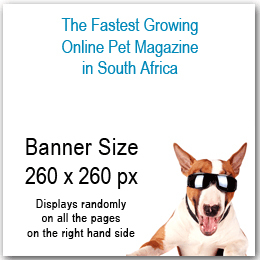 We are proudly known as the fastest growing online pet magazine. With over 55 000 visits (February 2018) per month, you are guaranteed a return on your investment. The first and best option to consider is to REGISTER YOUR PET BUSINESS here - lifetime free membership. You can't get much better than that now can you ? The next option is for you to stand out from the crowd. You have a choice of 6 Options to consider and our rates are the best you will find on the internet. We are proudly supporting #Local. Prime advertising exposure on the front page. Contact us for more details on this awesome offer. Be seen by over 4800 Happy Subscribers. Give us a try and see how your product performs with great advertising exposure to the right audience. Rate: If you are a Pet Services Listed on PetHealthCare = R400 for 6 months (not per month!). Advertising Bouquet : Option 2,3,4. above: That is, 3 sizes of banners (600x100px, 260x260px and 800x200px) all rotating randomly in various locations all over the 800+ pages on the site. NOTE: All advertising rates are for a 6 month period. Should you wish to place an advert for longer, then we can negotiate accordingly.